Every Friday, a group of us guys has lunch together. Same restaurant. Same table. Usually, the same meals. Through the years, some people have taken to calling us the Mafia. We don’t get anything accomplished, but we think the world would be a better place if people listened to us. One member of the group of full of old-time ideas about such things as the weather. For example, he says that if you hang a dead snake over a fence rail, then it will rain. It has rained a lot lately, so, today, I asked him if he had been killing snakes. His reply was that he hadn’t seen any snakes. Maybe, they knew it was about to rain, so they stayed out of his way. Since lunch, I have been thinking about superstitions and traditions such as this. I have heard them all of my life, and they sound like something that you would find in the Farmer’s Almanac. I wonder if people in different parts of the country have different things like this. I mean, is the dead snake idea universal, or is it a southern thing? There are a lot of southern things that have come down through the generations. 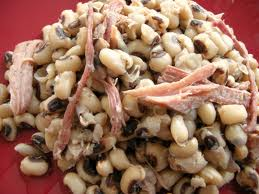 Prominent in my family is the idea that you should eat black-eyed peas and hog jowl on New Year’s Day. If you do this, then you will have good luck for the rest of the year. When I was a kid, I hated the idea of eating black-eyed peas, but my dad insisted that we do it. Surprisingly, I liked the hog jowl. Overall, I suppose it works. As a family, we have had pretty good luck. Another tradition is making boiled custard at Christmas. When I say boiled custard, I don’t mean egg nog. This is completely different, and it is completely good. I don’t know what’s in it, and I don’t know why people only make it at Christmas. In my mind, anything that good is worthy of year round consumption. Being a strange child, hearing people talk about boiled custard always made me think of George Custer. There is another tradition that is dying out, and I want to experience it before it does. 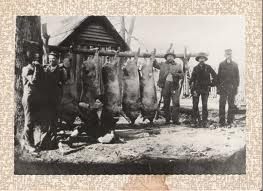 In these parts, people have always killed hogs on the day after Thanksgiving. In the old days, my grandfather had a hog-killing on his farm. Obviously, it involves a lot of blood, but it was necessary to have enough meat for the winter. Also, they needed the hog jowl to put in the black-eyed peas for good luck. Few people still do it, but the family of one of the Mafia members continue the tradition. This year, I’m taking part. The day after Thanksgiving is known as Black Friday. I bet the hogs wish they were out shopping. These are all traditions of the south. Are they also traditions in other places? What’s the old-timey way of doing things in your part of the world? 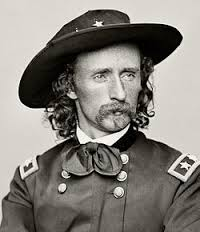 Being a strange child, hearing people talk about boiled custard always made me think of George Custer. Really? I haven’t watched much of them. I need to check it out. According to DVDtalk, this episode is available on this disc. Scroll down to the second paragraph below the images of the Chipmunks as pilgrims. Thanks. The food is good stuff. You had me at “Mafia.” You know, me being from Jersey and all. There was a group of politicians around here known as the Hillbilly Mafia. They really bought into that name.